We have just released the stable version of DJ-Classifieds 3.7.6 with OpenStreetMaps support (via Leaflet). Cheers and thanks for this suggestion! I'd like the Seller's Avatar to appear on the Bottom of their Ad in the Masonary View.. like it is in the "Offer-up Demo"
The option to set the max. amount of ads per minutes / hours / days in DJ Classifieds, to prevent a lot of spam ads. Mine isn't an idea but a needs that involve all EU users. Your GDPR measures aren't very good to be full compliant with GDPR. I urgently need a plugin for JoomlArt GDPR for DJ-Classifieds. Suggesting to implement correlation between expiration and promotion for adverts at the time of advert creation and after advert is posted. 1. To restrict promotions based on advert expiration at the time of advert creation. 2. To allow promotion for adverts but no longer limited by expiration. If you set up multiple duration periods for ads (i.e. 7, 14, 21 days, etc.) and If you set up multiple promotion periods for different promotion types (i.e. 7, 14, 21 days, etc.). Let’s say a user wants to publish an advert for 14 days and wants to promote it as well. 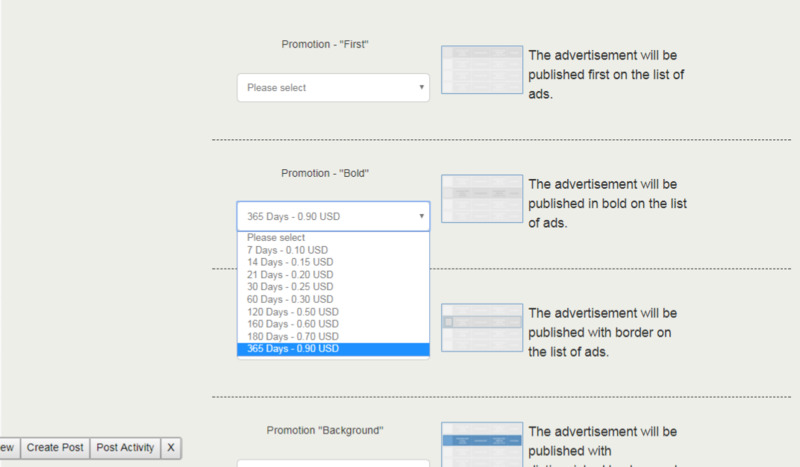 In the drop down menu for promotion types https://snag.gy/4yhMIK.jpg the user sees all promotion periods. This is confusing because the user can post an advert for 14 days but chose/pay to promote it for 180 days. When hes advert expires and user doesn't want to extend it a refund to the user for the overpaid amount has be issued. We know that some users will detect it and not pay for more they need to, but not all users are tech savvy, so if users pay for 14 days they should be restricted to buy promotions for only 14 days at the time when advert is created. User published for 14 days, 7 days left and the user wants to make promotion on the advert and he knows that advert will be renewed, so he selects 21 days promotion because longer promotions are usually cheaper and this will be better for him then selecting now 7 days and later 14 days. The compromise in this scenarios is to limit users during advert creation to buy promotions for as long as they set their advert will last. However, after an advert is created and published, the user has to have a choice to chose whatever promotion needed for as long as needed. An option for users to "unarchive" or restore their own archived items would be great. This could be handy for items that are temporary unavailable, or users who would like to create listings to publish them at later date. Alternatively it would be great if a listing could be set to "private" (only visible for the user) instead of published by default. Section Personal Messages for "DJ-Classifieds"
Very required applications for sending and receiving personal messages on the site in "DJ-Classifieds"
The existing component "uddeIM PMS" looks, to put it mildly, out-of-date and not beautiful in design (the generation of chats that was the years before). This application is rarely updated. I, probably, many of your customers would like to have something modern on the site so that you could create a dialogue on the topic of the ad from which the user submitted a personal message to the author of the ad. Now the existing component does not work after the last updates, the user sends a message to the author of the ads, but the message is not displayed in the sent or received messages from the author of the advertisement. You can add the noindex option for ads. Because this is a duplicate problem. The user writes or copies texts from other sites, poor text with not many words ... this gives google SEO problem. This option can be enabled for all classified items or by individual ads-classified. You can now control the robot’s behavior for all ads, particular ads, adverts lists. The settings can be made globally, in the category settings, including, ad settings and the menu settings. This feature is meant for situations where users on your site are adding adverts that have copied text from different sites, and you do not want them to hurt your site’s SEO with duplicate content. make it possible to delete favourites from the blog view. Administrator should be able to bill the user in order to post more than X adverts. You set a limit like: free up to 5 ads. If you want more, than you have to pay. On some classified scripts i saw that is possible to convert ads map position into jpg image (for example Osclass). This will increase page speed a lot. Is good to have this option to load ad pages faster! Also will be good if it will be featured Professional (Paid maybe) and users can rate the Professional or leave comment. replacing the words with *** for example or you can choose what to write instead. Is there a way to implement "show on click" option on existing standard contact field? When i make my site the option to create a custom field and give it "show on click" function wasn't available, and not all my ads have phone numbers and emails on contact field that crawled from Google. Is there a way to implement "show on click" function on standard custom field ? When you have joomla "recaptcha" plugin enabled on registration, and you have enable dj-classifieds registration plugin there is no way for the user to register, because there is no recaptcha to fill. When the user try to register he gets "wrong code alert" because in the background recaptcha is working but not on the dj-classifieds registration.